« Brownsville, Texas: Smallest sit-down hamburger joint ever! We were a little hesitant at first as we crossed Poydras Street at Tchoupitoulas Street in New Orleans’s Central Business District. Mother’s Restaurant didn’t look like much but we were pretty hungry having walked for several hours, so we decided to take a chance. We entered in through a side door since a sign, on what looked to be the front door, advised us that the door was broken. We walked in to see a huge rectangular room with lots of people, but not a lot of tables. An old-fashioned table ledge with stools lined one wall overlooking the street. People of all ages, and all colors, milled about, or were seated at grungy tables (some over-laden with garbage). But everyone seemed to be chowing down just fine. After a couple of false attempts, we figured out the system. Don’t wait around to be seated and served. This is a do-it-yourself kind of place. Grab a menu; place your order at a counter manned by a very talkative young woman. If you don’t know what to order, go for the tried and true “po’boy” sandwich, made with the “world’s best baked ham” because that’s Mother’s specialty (the restaurant bakes it own hams). Or try the seafood gumbo or crawfish etouffée. The young lady will give you a till tape receipt imprinted with your items, your name, and a number. Keep your receipt, and find a table. Clear the piled debris if you must; there is someone bussing tables, but this place is so busy, she has a hard time keeping up. By the way, “debris” has a second meaning at Mother’s – it’s the bits of beef that falls into the gravy while roasting the meat. 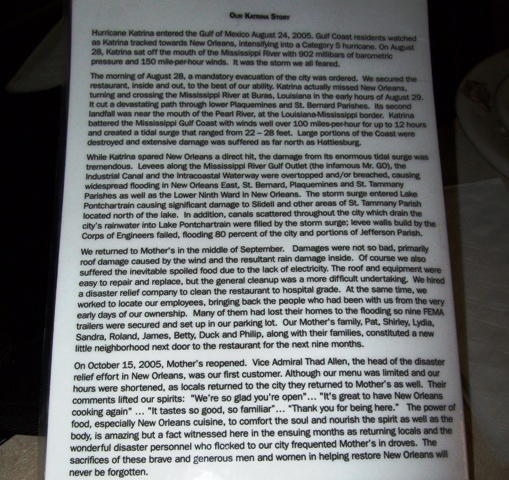 Flip over a menu and you’ll find the restaurant’s very own Hurricane Katrina survival story. 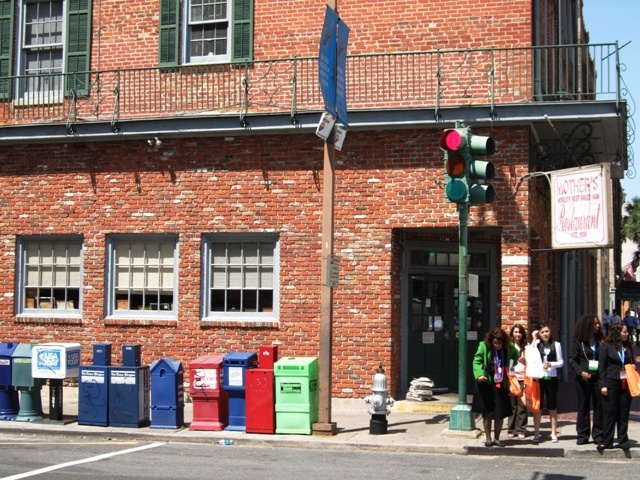 In fact, Mother’s re-opened a fairly short time after the hurricane’s devastation of the city; on October 15, 2005, the head of the disaster relief effort in New Orleans, Vice Admiral Thad Allen, was the eatery’s first customer. So many of Mother’s staff had lost their homes in the storm that management had to set up a temporary trailer park — in its parking lot. For nine months, staff lived in trailers provided by FEMA (Federal Emergency Management Agency). Established in 1938, Mother’s made its name with its simple home-style cooking. Founded by Simon A. Landry, and later sold to the Amato brothers in 1986, the restaurant has remained a very popular diner in the Big Easy. In a year (according to the menu), Mother’s cooks “as many pies as there are ships passing through the port of New Orleans (3,500). We opted for the Ferdi Special, a po’boy sandwich on French bread with shaved baked ham, roast beef and gravy; a thick and delicious seafood gumbo with generous chunks of seafood; French fries, skinny and tasty, many with the skin still on; and moist and delicious bread pudding covered in a buttery caramel hard sauce. This entry was posted on Tuesday, April 8th, 2008 at 4:48 am and is filed under Adventure Travel, Budget Travel, Family Vacations, Food and Wine, New Orleans, Ports of call, Tourist attractions, Travel - General Advice, Travel Destinations, Travel tips, United States. You can follow any responses to this entry through the RSS 2.0 feed. Responses are currently closed, but you can trackback from your own site.